Wales centre Scott Williams is facing a period of time on the sidelines after tearing a hamstring in the Ospreys' victory over the Cheetahs. Williams limped off after 49 minutes during the region's second win of the Pro14 season. Head coach Allen Clarke described the prospect of losing Williams as "sickening". "We will wait for scans but it is not something that is going to clear up in the next couple of weeks," said Clarke. "It does not look great at the moment so it is probably why I am not as stoked with the scoreline." Defence coach Brad Davis confirmed Williams will at least miss the trip to face Munster this Friday, with the region still awaiting scans to determine the severity of the problem. 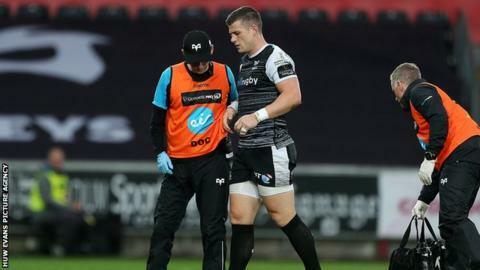 Williams' injury is another Ospreys backline problem after outside-half Luke Price suffered a fractured leg in the opening Pro14 win over Edinburgh. "It (Williams injury) was similar to last week although it is not as significant as that," said Clarke. "But you can tell with Scott limping off like that with a hamstring problem and he is reacting like that, it is not particularly good. "It is sickening to lose anyone, especially somebody with the calibre of Scott as a player, leader and tactician. "We were saying all along we were going to face those challenges and other teams will get their bumps and bruises. "Joe Thomas came on for Scott and I thought he was excellent and he has been outstanding in pre season. "It might be Joe's time to stand up. We had 22 out of 23 Welshmen in the squad today and I doubt any team in Europe has that ratio of born and bred players." Full-back Dan Evans and prop Nicky Smith were also forced off with head injuries in the first-half at the Liberty Stadium and are likely to miss next Friday's trip to face Munster in Cork. Clarke was concerned with Smith's injury and the manner in which he was dealt with at the breakdown. "It was dangerous for me," said Clarke. "We need to have a better look at that and protect players when they are in the jackal position. "Sam Warburton has already talked about that this week. We want the game to be a contest and I thought Nicky had every right to the ball there."